In den sanften Ausläufern der Blue Ridge Mountains begrüßt Sie das Still Pond Farm nur eine kurze Fahrt von Charlottesville, Skyline Drive und Virginia's Weinland entfernt. Unsere Farm bietet wunderschöne Ausblicke auf die Berge in einer ländlichen und friedlichen Umgebung. Die zweistöckige Hütte mit Loft befindet sich in der Nähe unserer Stallungen und bietet einen Blick auf unsere Koppeln und den natürlichen Teich. Erleben Sie die Schönheit und Aufregung eines aktiven Pferdehofs. Alles wird wie eine Familie behandelt! Reisende Equestrian auch willkommen. Bitte kontaktieren Sie uns für Details. The cabin was cozy and well appointed. It was a little more in the middle of farm activities than we had anticipated, but that did not detract from our enjoyment. The property is beautiful, with many horse trails to walk along and gorgeous rolling hills. The folks on property were friendly without being intrusive. Thanks for a great getaway! Stayed for a quick girls weekend. Awesome to see the horses and wildlife. It’s beautiful! Would definitely stay again! Our family of 6 enjoyed our stay in this comfortable, nicely decorated, well appointed cottage. Horse stable and barn cats right outside our door were a welcomed treat. Perfect for a weekend getaway, just bummed the falls colors weren't quite on full display. Owners were helpful and attentive. Thank you again for visiting Still Pond Farm! It was a joy to meet you, and we are so glad that enjoyed the cottage, horses and barn cats. We do hope that you visit again! This was the cutest cottage! Owners were very helpful, what a great relaxing weekend away! The property was perfect for our girl’s weekend away. The owners made it super easy for us to check in. Everything was exactly as it was described. I definitely will be looking forward to our next trip here! We had a wonderful time at the Cottage at Still Pond Farm. The location was perfect for what we were looking to do-an easy drive to Monticello, Montpelier, and Skyline Drive/Shenandoah National Park. The farm itself was amazing-just as advertised with an atmosphere of tranquility and spectacular views. On the one afternoon that it did rain, a day that would normally be a disappointment was just fine, as it was a treat to just sit on the rocking chairs on the front porch and watch the rain fall in these beautiful surroundings. Despite its wonderful rural setting, there are numerous restaurants and grocery stores less than 10 miles away, and a great little convenience store just across from the entrance to the property if you need anything in a pinch. Joanna was a wonderful hostess, and we are grateful to Nina for allowing us to get to know the horses during our time there. The barn cat Smoky was also a constant source of entertainment as she is definitely a character! As for the cabin, it was very comfortable and plenty spacious for the six of us adults, and had everything we needed-we appreciated the extra touches Joanna went above and beyond to consider, such as extra pillows and blankets in all the bedrooms. The first floor bedrooms, bathroom , and ramp up to the front porch were also a bonus for my mother, who does not get around easily anymore. 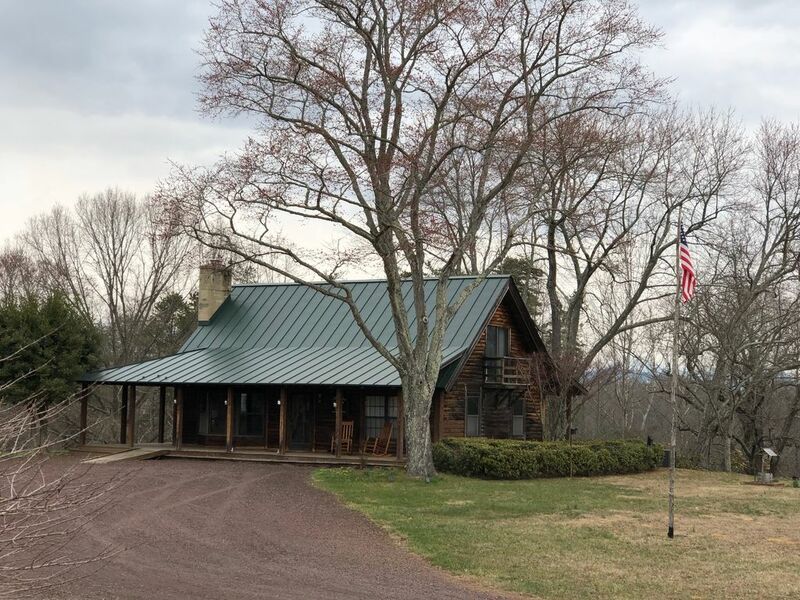 I would definitely recommend this cottage to anyone looking to see the sites in the Charlottesville area, spend some relaxing time in a beautiful setting, or both! !